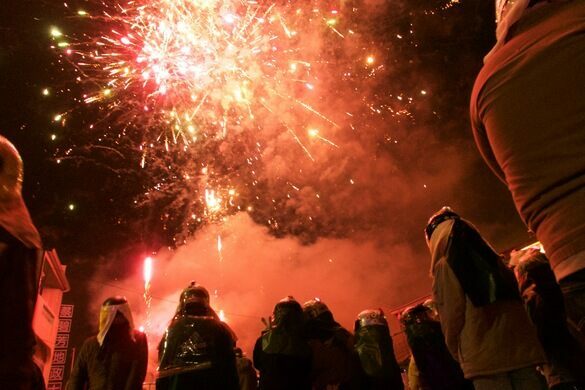 A festival where people vie to be bombarded by exploding clusters of fireworks. 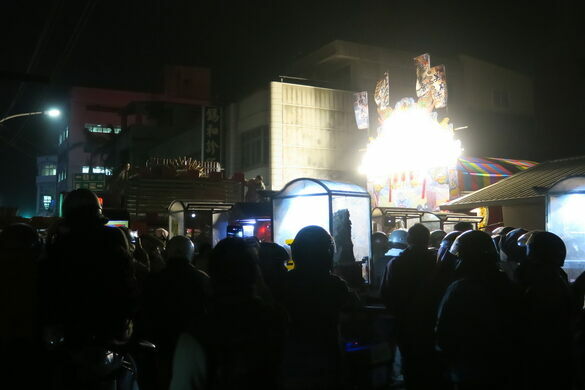 While much of Asia believes red decorations or sky lanterns can bring good luck in the new year, locals in the Yanshui district of Tainan believe that the more times you’re hit by a rocket, the better. 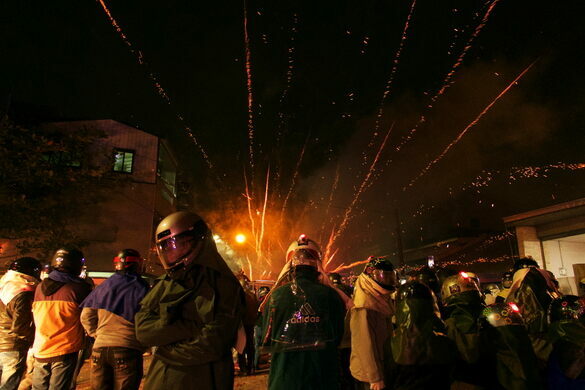 Fifteen days into the Chinese lunar calendar, on the evening of the Lantern Festival, the district launches millions of fireworks directly into eager crowds. Thousands don motorcycle helmets and protective gear, take a swig or two of liquid courage, and take to the streets for a chance to be battered by explosions. 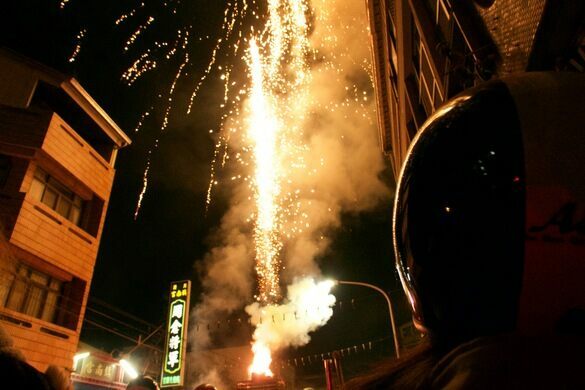 At this festival, nearly catching fire is considered a good thing. The festival begins with a parade of palanquins, each carrying a holy figurine. Giant cylinders known as beehives are stuffed with bottle rockets and placed every couple of yards along the parade route. As the parade inches through town, crowds rush to huddle around the beehives. Sirens wail to warn anyone with second thoughts, and then the hives are lit. Within moments, trails of light scream in all directions like a swarm of angry bees bursting from a nest. Flaming cardboard rolls ricochet off helmets, leave bruises, and explode at random inside the crowd. People will throw down their own rockets from apartment balconies above, contributing to the mayhem below. 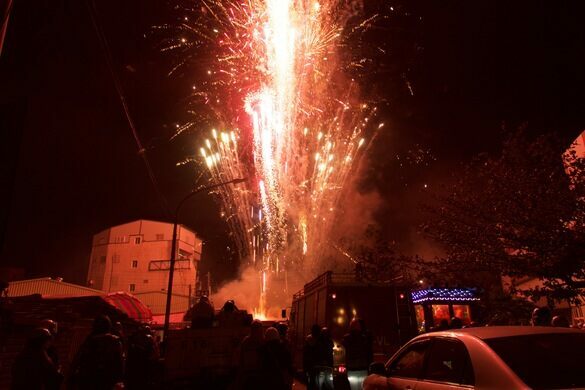 The blast lasts only a minute or two before culminating in a dazzling skyward fireworks display. The origins of this strange custom date back to the late 1800s, when a cholera epidemic ravaged the town for more than 20 years. The locals asked the Chinese god of war, Guan Gong, to ward off the disease. On the day of the Lantern Festival, firecrackers were set off along the road in the hopes of inviting Guan Gong to the village. The epidemic subsided, but the tradition continued—and grew. Today, one beehive can hold anywhere from 10,000 to several hundred thousand rockets. These can cost up to $2,000 to construct but the luck they bring is worth the cost. Far from being just a burn threat, a rocket trapped inside a helmet can cause temporary hearing loss or permanent blindness. Nevertheless, people from all across Taiwan continue to travel to Yanshui for a shot at some luck of their own. 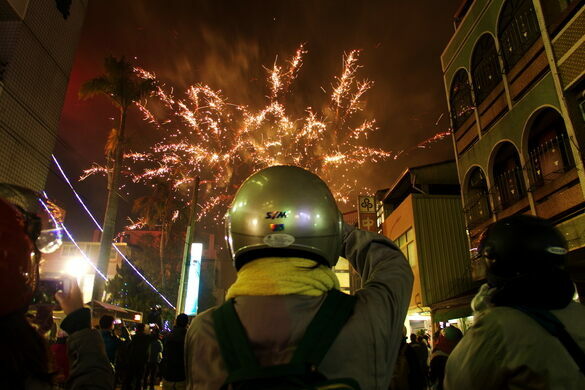 The Yanshui Beehive Fireworks Festival occurs 15 days into the Chinese lunar calendar each year. It can be disorienting for outsiders, and public transport from Tainan City to Yanshui district is complicated. For the best possible experience, try to attend with someone who is a festival veteran. In addition, visitors who would like to come away with functioning sensory organs should plan to wear flame retardant clothes, a scarf, gloves, and a full face motorcycle helmet.